A bamboo area rug is beautiful, durable and flexible. They’re in high demand and yet priced right for almost any buyer. Very much in style and the perfect compliment to today’s designer trends. Based on the age-old Japanese art of tatami mats, modern bamboo area rugs are far sturdier and built with today’s household in mind, including special protective treatments and colorants that maintain the rug’s eternal character and usefulness. These rich natural fiber rugs are like giant heavyweight mats, that easily lay over carpet, tile, cement, or other surfaces. They come in a rainbow of bright colors as well as natural earth tones. When you're thinking about putting a rug in any area, a bamboo rug is worthy of your consideration. A bamboo area rug provides a touch of Zen to your peaceful living space. Whether your décor is Asian hip, sophisticated professional or even "anything goes," these handsome rugs make a solid statement without taking a big chunk out of your wallet. For starters, they're way more than just reeds that are hastily woven together. It may have a slight resemblance to the throwaway beach mats you’ve used for picnics on the sand, but a bamboo area rug is much more evolved and refined. Bamboo area rugs are constructed of high quality materials and time-tested methods. The planks used in bamboo area rugs are a special type of timber bamboo, used throughout Asia for centuries in furniture, flooring, and dinnerware. The bamboo is first aged to harden the material and enhance the natural lacquer. Once it reaches the right age and color, it is prepared for rug-making through kiln-drying or carbonizing techniques that remove all traces of liquid, and harden the integrity of the wood. Fully dried and prepped bamboo has very little chance of cracking, breaking, or splintering, so you’re assured a quality product. Bamboo that’s meant for indoor use is naturally resistant to scratches and is polished and finished to a pleasant, smooth shine. 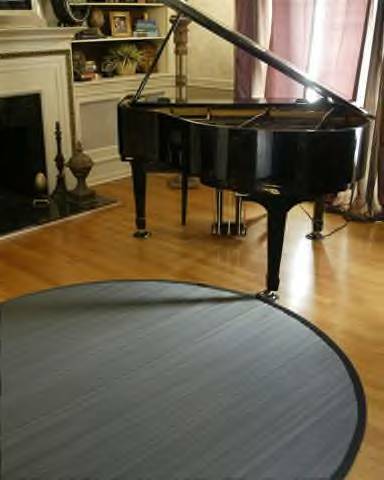 If the rug is intended for indoor/outdoor use, then the bamboo strips are treated with polyurethane. This provides waterproofing and enhanced resistance to more serious scratches and abrasions. 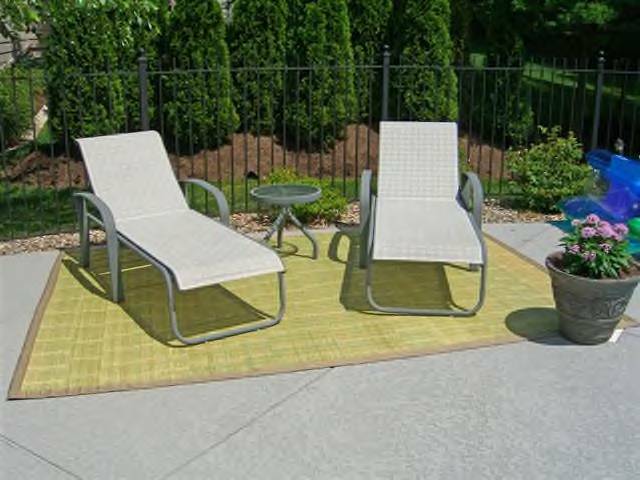 The polyurethane also protects against harmful UV rays, which can cause sun fading. The 100% natural bamboo timbers are artfully loomed to form a strong rug surface, which is then framed and strengthened by an additional border (cotton, canvas, or polypropylene for outdoor varieties). The framework and planks are loomed by hand or machine, depending on the rug, so the entire piece is functional, fluid, and immensely strong. Most of the bamboo area rugs available on the market are also backed with felt or non-slip, skid-resistant material for added padding and protection. Because of this, even the smallest size can be used on a slick tile surface without fear. They’re available in a fantastic array of geometric shapes, as well. The most common, of course, is the rectangle or square - but round, octagon, and hexagon shapes can also be found! As far as colorants go, many people instantly think of “Zen neutral” when they imagine a bamboo floor covering. While the bulk of bamboo area rugs are earth tones, ranging from creams and browns to black, yellow and sage green, there are also plenty of dyed varieties in eye-popping hues. Lantern orange, dragon red, hot rainbow, and bright jade green are just a few of the colorful varieties that can add a splash beyond the muted basics. Some bamboo area rugs are screen-printed or hand-painted, for even more character. So, go neutral or go bold - it’s your choice. Best of all, a bamboo area rug can be rolled for quick transport. Many styles are available with zippered bags so you can tote them from poolside to surfside with ease. They could well be the only rug you’ll ever buy that can go almost anywhere with you, and still be stylish and strong. Think of the possibilities! No matter what the area, a bamboo rug will enhance it. Durability, beauty, and practicality make these elegant basics an excellent investment. Try them in the kitchen, bath, dining room, living room, dorm, or anywhere you like. They have the unique advantage of looking simple and delicate, with a strong and sturdy backbone. Bamboo area rugs are very affordable. And, with their wipe-clean surfaces and an easy-on-the-foot feel, you’ll be outfitting your entire home with these traditional wonders in no time.